The days are starting to get steamy and we’re entering into the dog days of Maryland summers. As always there are so many places I want to be but have so little time. 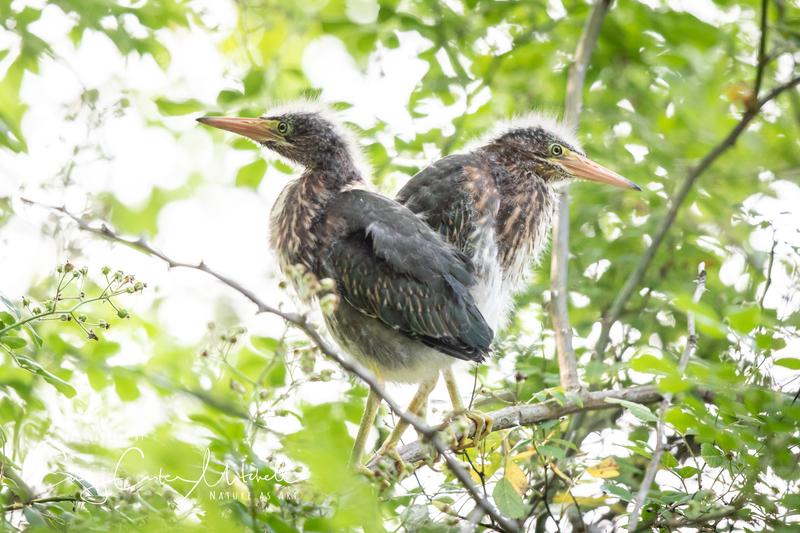 One special thing I certainly wanted to try for was a Green Heron nest in a nearby community lake that I had heard about through the birding network. I arrived early in the morning and wondered where the nest could be. I started to walk the large lake and witnessed the two parents flying…the other way. So I backtracked and found myself at their favored fishing area. They are smaller wading birds but full of color. Looking at looking I finally picked one out in the midst of all of the rock along the stream and so I set up and within quick order he grabbed a large sunfish and gobbled it up. After he had his breakfast he flew back up the lake. Sigh..time to schlep the big lens and tripod back up the hill and around the big lake to find out where it went. It’s not like the nest has a marker on it or anything and I didn’t notice any other birders or bird photographers about to give me a hint. And so I walked in the hot humid morning, listening to the lilting calls of nearby Baltimore Orioles and then I heard a strange chipping coming from a bush along the water. I listened and looked and finally the mom divulged the location of her fledgling Gray Catbird hidden in all of the greenery. It was so adorable that I spent some time there watching the parent go forage on the ground for fallen Mulberry berries and to return to feed the chick. Then suddenly I saw one of the Green herons fly in and land on a dead tree branch right near where I was standing. And this is when the young Green Herons showed themselves excited for breakfast as well. All I had to do was turn around and really study the tree overhanging the water and I would have found them! They are so funny looking and cute in their own way. Most certainly a special thing for me to enjoy in nature as Green Herons are usually very shy. It certainly goes to show, the quiet and patient wildlife photography will be well rewarded. Oh. My. Goodness. Emily, all three chicks are too cute but those two heron chicks complete with their baby-fuzz are heart-melters. Right place, right time – a fabulous reward for your search! Fantastic shots!!! I love baby birds and the baby green herons are adorable. I’m with you Jennifer. I love baby anything and these little ones were too cute. Thank you very much. “there are so many places I want to be but have so little time”: I totally agree! Story of my life Pit. I need 36 hours in a day and to be cloned to do all that I would like to do.